company in a complex environment”. Invested in Guatemala and I am not the only foreigner who does, because there are many spaces available in the market, although you have to have a nose for investment. In this country, there are great opportunities in traditional businesses, but you can certainly work in different and innovative businesses. 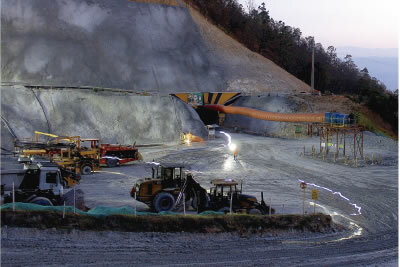 As EMOCON GROUP we have participated in the development and construction of underground tunnels, roadworks, mining and hydroelectric power plants. I did not imagine the impact that the company would have when we started, however, the company created its own school to produce skilled labor, finding talented workers who are the foundation that allowed us to grow quickly. From 2004 to 2017, we were contractors for several multinational companies for which we built more than 50 kilometers of tunnels of all sizes and technical characteristics. I remember that in the Guatemalan construction market there was no one who wanted to do that kind of work. Traditional construction companies did not want to assume the risk of underground work, recognizing this, I took the opportunity to build my own business in a field where not many wanted to be. Over the course of 13 years and having grown to a 400 collaborator payroll, we have found support and solidarity in local supplier companies, which have supported us, and have helped us expand our operations to Honduras, Nicaragua, El Salvador and Colombia. In EMOCON GROUP we have learned to adapt to the changes and demands of the construction market, although the spirit of constant innovation always prevails. We are the only company in the underground construction sector that has made progress in the country and Central America and we have formed our trained staff of more than 10 nationalities, a great team of experienced employees. We are focused on a select market with considerable billing, since the activities in our construction segment run the 365 days of the year, for which we developed a very efficient Planning and Logistics Department. We work in an area where international competition of very select companies is strong. Underground and hydraulic construction is a highly sensitive segment regarding security management for all processes that make up its work so the philosophy of safe work management is essential for EMOCON GROUP. As a golden rule we have experienced that when investing in any productive sector, we must remain flexible and open to change. You have to take the time to know the market and persevere. Guatemala, as a country, offers great opportunities that become a profitable business if people prepare professionally, have a fighting spirit and the will to grow. Our commitment as a company isn’t limited only to meeting the expectations of our customers, but to exceed them. “More than two decades ago, Guatemala opened its doors for me to venture into a nontraditional economic sector. Perseverance allowed me to make a dream come true, to run a company in a complex environment”. Dr. Fridolin Birk, German, Economist, Geologist and CEO of EMOCON Group Invested in Guatemala and I am not the only foreigner who does, because there are many spaces available in the market, although you have to have a nose for investment. In this country, there are great opportunities in traditional businesses, but you can certainly work in different and innovative businesses.